This will come as no surprise to those who have been following Tin Can Knits for a while, but Emily and I love geometric fair isle. The tiny repeats in the Tenderheart pattern were really fun to swatch and choose and I doubt we are done with the idea yet! While one of us usually takes the lead on a design, our patterns with Fair Isle are among our most collaborative. We go back and forth on chart variations, make a few swatch hats, and the final product is usually a mix of us both. Tenderheart has a simple construction, like all of the patterns in Heart on my Sleeve, it is worked from the bottom up (sleeves and body first, then all joined together for the yoke). 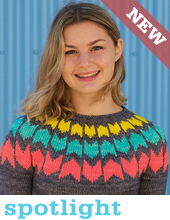 The Fair Isle is a small repeat, with short floats, perfect for those with limited colourwork experience. We used Madelinetosh DK for the grown up version in a few of my favourite colourways: Antler (the perfect neutral cool white), with Tart and Scarlet for the contrast. For Jonesie’s sweater I used John Arbon Textiles Knit by Numbers DK. Emily knit up a Prism hat from Mad Colour in this yarn and I couldn’t wait to cast on a sweater in it! The yarn is soft and heathered and the colourwork really popped in the black and white! I love the contrast cast-on detail (I might have been adding it to everything lately! ), and of course, the heart on my sleeve. This heart motif was created by Mary Jane Mucklestone, a genius at Fair Isle, who has literally written the book on it! 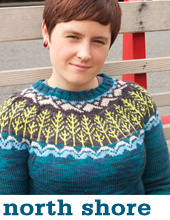 If you haven’t joined the Heart on my Sleeve KAL yet, check it out! There are fabulous prizes and lots of knitters clicking away already. 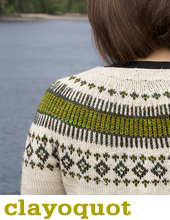 Such gorgeous sweaters, and I love the yoke!! What a perfect sleeve details, too. This whole collection is wonderful. Lovely sleeve detail with the heart! and I love the cast on detail as well. There are several patterns in this collection that I have added to my queue. Wonderful compilation! I’m on a big yoked, fair isle kick right now. I’ve got the ebook, plenty of yarn & needles to spare. Unfortunately, I’m lacking time! This is my busiest season @ work & I’m stuck participating in the KAL vicariously for now! Bummer, because the prizes look delicious.